At Boku Slots we love unique games that border on the bazaar and Machine Gun Unicorn definitely fits that description. Someone at Genesis Gaming sat down and thought, let’s combine machine guns with unicorns and turn it into a slot game. With insanely creative graphics, that include zombie heads in jars, this slot is almost too much fun to play. 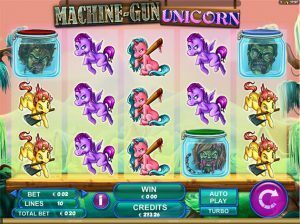 Machine Gun Unicorn is a fixed 10 pay line slot game, with winning combinations running from left to right when completed. The RTP on this game is an impressive 97.187% and there is a turbo option too, whose function is to simply speed up the gameplay. Bet Amounts – Betting begins at 1p and goes as high as £25 per pay line on Machine Gun Unicorn. This means that the cost per spin starts as low as 10p and increases to £250 per spin. So this game can accommodate even the highest of high rollers. Symbols – We love the creativity of the Genesis design team with the symbols on Machine Gun Unicorn. You will find the Golden Unicorn fully armed with a machine gun for a horn, zombie heads in a red, green and blue jar, and unicorns in purple, pink, blue and yellow. The highest value symbol is your red zombie in a jar and your lowest is the yellow unicorn. Wild Symbol – The Machine Gun Unicorn symbol is your wild and will substitute for any symbol required to complete a winning combination. The only downfall is that the wild symbol only appears on the third reel. Symbol Bomb Feature – This is one of the simplest features you could happen across in the slot world. Once the wild symbol appears on the screen it is triggered. If there are any zombie head jars on the screen, the machine gun unicorn wild symbol will blow them up. These then become your winnings and the more jars you have the higher the prize increases. If, however, there are no zombie heads on the screen to blow up, you will receive a special award as a result of landing the feature symbol. 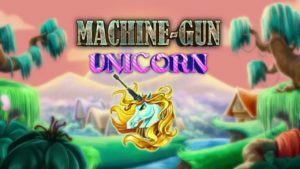 Whilst Machine Gun Unicorn slot has quickly risen the ranks of our favourite slots, there are two minor issues. First is that the wild only appears on reel 3 and whilst this doesn’t have a hugely negative effect on the game itself, we think it would benefit more if the wild appeared across all reels. The second is the soundtrack, it sounds like a cutesy teen track mashed together with an action movie theme tune. This was a little off putting for us so we switched it off. Other than that we found Machine Gun Unicorn to be thrilling, when you just focused on the game itself. With a great RTP the winning combinations can come thick and fast.